Yesterday marked the one-year anniversary of Marielle Franco’s brutal murder. Black, queer, born and raised in the favelas, and a single mother since 18, Marielle was a city councilmember from Rio de Janeiro who used her platform to fiercely champion LGBT and women’s rights in Brazil — intersectional advocacy built from intersectional experience. Her murder on the evening of March 14, 2018 was a brazen reminder to many Brazilians that no matter how accomplished, high-profile, or beloved by the people, Black and queer lives are expendable; their killers can act with impunity. One woman aptly captured the collective consciousness of Brazilian women after Marielle’s murder: "They did not just kill her, but all of us, all black women... they killed our hope." Many activists saw in Marielle’s assassination a clear message aimed at Black people, feminists, and lesbians to "know their place" and not enter public life claiming full citizenship. Indeed, that message reverberated across Brazil during the past year as the investigation of her murder dragged on without any concrete results, while prominent activist groups around the world — and even the United Nations — called for a thorough and transparent investigation. But incremental progress arrived last Tuesday, albeit long overdue. Brazilian police arrested former military police officers Ronnie Lessa and Elcio Vieira de Queiroz, whom prosecutors say executed the drive-by assassination one year ago. These arrests are a first step towards dismantling the culture of rampant impunity for violent crimes in Brazil, crimes that disproportionately take the lives of black women. The homicide rate among Black women was 71% higher than that of non-Black women as of 2016. There are indications that this crisis is getting worse, not better; indeed, while there was an 8% decrease in murders of non-Black women over a ten-year period ending in 2016, the number of murders of Black women increased 15.4%. Despite this rise, in 2015, prosecutors filed charges in only 12% of homicide cases, the results of which cannot even be interrogated because Brazilian courts do not regularly publish such data; we cannot quantify the problem, let alone redress it. As the investigation now turns to how Marielle’s assassination was ordered, we must not forget what her assassination illustrated. Marielle grew up in one of the poorest and most dangerous slum complexes in Rio; she earned her way to one of Rio’s most prestigious universities on a full scholarship; she ran for city council on a campaign that embodied an inclusive and intersectional ethos: lifting up black women, LGBT, and favela youth; and she received the fifth highest number of votes out of more than 1,500 candidates. She then used her platform to consistently speak out against state violence and on behalf of her community’s most marginalized. For doing so, she paid with her life. We must not forget Marielle’s legacy. Outrage over Marielle’s murder inspired an unprecedented number of black female candidates to run for office explicitly adopting Marielle’s platform; and last October, Brazilians voted them into office. One of those elected was Marielle’s former chief of staff, Renata Souza. In this way, while Marielle’s assassination was a horrific and devastating event, her legacy lives on through those she inspired, and through the conversations that persist, not only in Brazil but here in the United States. America, like Brazil, suffers from intersectional violence not held to account. 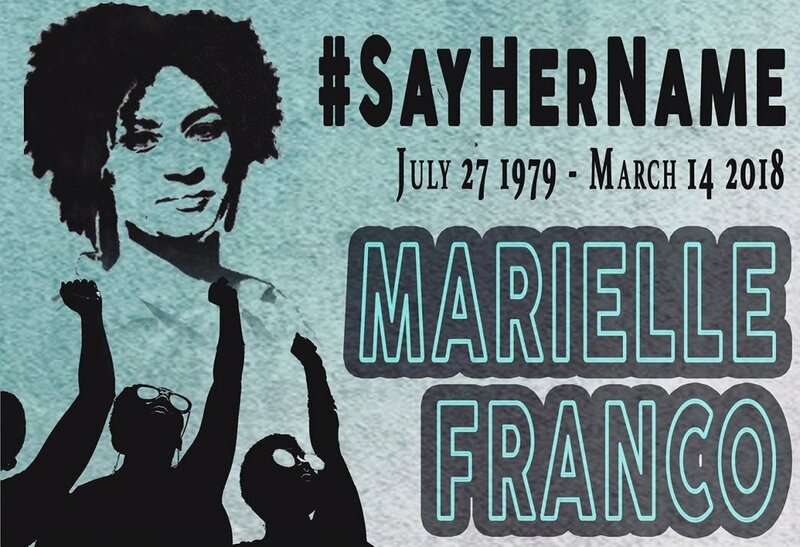 In this way, Marielle’s legacy is not geographically bound; rather, she lives on not only through Brazilian intersectional advocacy, but American projects demanding justice for rampant and often overlooked state violence against black women. This International Women’s Day, we’re launching episode two of Intersectionality Matters with Kimbelé Crenshaw! : "I Believe I Can Lie, R. Kelly (Still) in Denial" to celebrate Black women like Kenyette Barnes, Oronike Odeleye, dream hampton, Tarana Burke, and countless others who have forged new platforms for survivors of sexual violence to resist against adultification, false narratives, and cycles of abuse that relegate Black women and girls to the margins and subject them to untold violence. On this timely and trenchant episode of Intersectionality Matters, host Kimberlé Crenshaw (@sandylocks) dives deep with #MuteRKelly co-founder Kenyette Barnes (@legisempress) to rupture the rhythm Kelly has used to give Black women and girls the blues for decades. R. Kelly’s serial abuse of Black women and girls has been one of the entertainment industry’s worst-kept secrets for the entirety of the 21st century. In the mid 90s, Kelly was romantically linked with and even briefly married to 15-year-old singer Aaliyah, for whom he wrote and produced the incriminatory hit “Age Ain’t Nothing But a Number.” An explicit bootleg tape which appeared to feature Kelly abusing yet another teenage girl circulated on street corners as early as 2001. In 2017, a Buzzfeed exposé alleged that the man who famously crooned “I’m a bad man / And I’m not ashamed of it” held several women captive in his home in a cult-like harem. Yet it took the convergence of the #MuteRKelly movement, the January 2019 release of documentary Surviving R. Kelly and popular culture’s broader reckoning with the pattern of sexual violence perpetrated by powerful men for the self-proclaimed Pied Piper of R&B to face consequences for orchestrating his salacious symphony. At long last, Kelly has now been charged with 10 counts of aggravated criminal sexual abuse involving four women, three of whom were minors at the time. You can also join our patreon site for exclusive podcast content. As always, we relish feedback from you, our cherished supporters and treasured allies in the fight for intersectional justice. Please reach out with your questions or comments about the podcast via email or direct message on the podcast’s official Twitter and Instagram. We thank you for your support and invite you to subscribe to Intersectionality Matters today! Visit us at aapf.org to learn more! taking place in Los Angeles & virtually from March 24-29, 2019.
of color domestically and across the globe. are first come first served.